Energy access has huge economic development and human welfare benefits; without it, the ability to stay fed, healthy and earn a living is severely compromised. Recognising this, Practical Action’s first Poor People’s Energy Outlook (PPEO) report urges the energy sector to embrace the concept of ‘Total Energy Access’ which explores energy access across households, community facilities and enterprises. In 2010, one and a half billion people had no access to electricity at all. Three billion people relied on traditional biomass and coal for cooking. 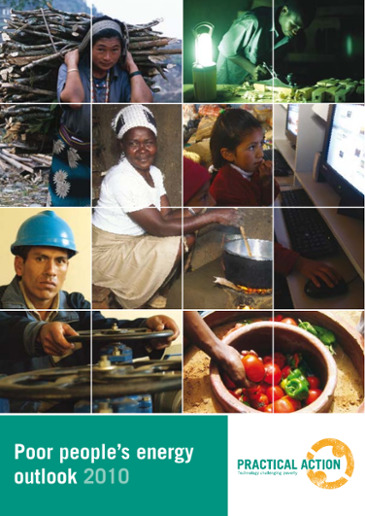 Using new research from Practical Action’s country offices and existing case studies from other organisations, the PPEO 2010 presented the perspectives of those living in energy poverty and practitioners working to tackle it. The report focusses in particular on the energy that people need in the home, while also establishing a broad framework for achieving universal energy access. Energy access must be measured holistically, in terms of the Total Energy Access services that poor people require; simply framing access in terms of megawatts produced and numbers of households connected will not suffice. A clear financial commitment is critical to achieving universal access. A variety of financial sources must be harnessed to raise the additional funds needed to achieve energy for all, and effective mechanisms for its application must be developed: including targeted government subsidies, concessional loans and grants, and cross-subsidisation of end-user tariffs. Energy access cannot be achieved by the formal energy sector alone. Governments, civil society and private organisations must work together, as part of an Energy Access Ecosystem, towards the achievement of universal energy access by 2030. Streamlined frameworks are needed to help a range of actors to participate in delivery. Development of local institutions for the delivery, operation and maintenance of energy services should be prioritised.